At least 13 large fires raged across California on Friday, threatening over 16,000 homes and leading to evacuation orders for nearly 25,000 residents in what is shaping up to be one of the worst fire seasons on record in the state. The surge in fire activity has led California to call for help to at least 17 other states and two countries. The state also has received assistance from the military, including active-duty troops and aircraft to assist in dropping water and retardant. California already has spent $230 million on emergency firefighting since the start of the July 1 fiscal year, according to Cal Fire. That is more than half the state’s $442.8 million annual so-called e-fund budget. Williams said extreme heat and dry conditions coupled with no shortage of vegetation fuels on the ground is exacerbating the risks of wildfires. There’s also an estimated 129 million dead trees in California, most of it in the central and southern Sierras. Nearly 14,000 firefighters are on the lines of fires statewide as well as several hundred active-duty military troops. There also have been dozens of military aircraft used in the recent California fires as well as a large 747 passenger plane converted to carry more than 19,000 gallons of fire retardant. The Boeing 747 plane dubbed the SuperTanker was put into service for retardant drops this week on fires burning in both the southern and northern portions of the state. It is contracted on a “call when needed” basis by Cal Fire and can cost more than $16,500 per flight hour. If the state exhausts its e-fund firefighting budget in fiscal 2018-19, it could tap other sources such as traditional budget reserves. Those reserves now total about $2 billion. The biggest of the blazes is the Mendocino Complex fire in Northern California, which continues to threaten an estimated 9,200 structures, according to Cal Fire. It now ranks as the largest wildfire in the state’s history. The monster fire has burned 119 homes and blackened more than 305,000 acres, or some 476 square miles — or about double the size of the city of Chicago. The cause of the fire remains under investigation by Cal Fire. Nearly 4,000 crews are assisting with the Mendocino Complex blaze, which is burning in Colusa, Lake and Mendocino counties. The fire, which is 53 percent contained, is burning mostly in wilderness areas about 120 miles north of San Francisco. Prior to the Mendocino Complex fire, the largest blaze in the state’s history was December’s Thomas fire in the Southern California counties of Ventura and Santa Barbara where more than 1,000 homes were lost and nearly 282,000 acres scorched. Another catastrophic fire last year was October’s wine country fires, which destroyed or damaged about 10,000 homes and resulted in 44 fatalities. The Mendocino Complex fire is burning in an area known for wine production, timberland and rangeland. There have been reports of damage to some of the area’s agriculture, including at least one vineyard and a pear orchard in Lake County. In Mendocino County, cattle operations and timberland suffered some losses. About 160 miles away the so-called Carr fire is burning near Redding, a Northern California city of about 92,000 residents. 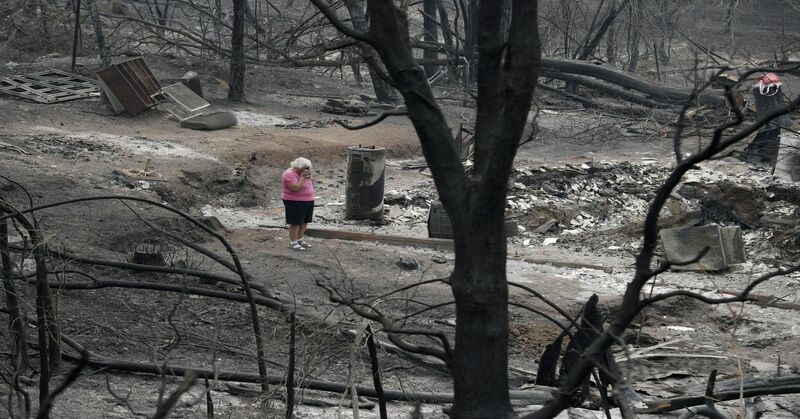 During the height of the fire, more than 30,000 residents were forced to flee the community in Shasta County. After 18 days, the Carr fire has charred more than 181,400 acres and is now listed as 51 percent contained. Authorities say the fire was caused by mechanical failure of a vehicle. Nearly 1,600 structures have been destroyed and 8 lives lost in the blaze. Moody’s Investors Service last week estimated losses from the Carr fire could approach up to $1.5 billion. “The Carr fire portends high California wildfire losses for the remainder of 2018, following almost $12 billion of insured losses for the October and December 2017 wildfires,” Moody’s senior analyst Jasper Cooper said in a report last week. Jake Mangas, president and CEO of the Redding Chamber of Commerce, said the fire didn’t discriminate and burned both luxury homes in the $1.5 million to $2 million range as well as mobile homes. He said it could take many years to rebuild destroyed homes in the community due to a deficit of labor in the construction industry. At the same time, Mangas said there’s an urgent need to help local businesses since many are hurting in the aftermath of the fire. He said the chamber is raising money for a business recovery fund to assist local merchants. More than 4,700 fire personnel are assigned to the Carr blaze. Agriculture Secretary Sonny Perdue and Interior Secretary Ryan Zinke are scheduled to visit the Redding area on Monday and expected to meet with local authorities and fire officials. The federal government is the largest owner of forest lands in California, holding about 57 percent of the roughly 33 million acres. Other large fires burning in the state include the so-called Holy Fire in Southern California, which is now threatening up to 3,150 homes. More than 21,000 people have been forced to evacuate from the blaze in Riverside and Orange counties. The Holy fire has burned more than 18,000 acres in mostly steep and forested terrain and was listed as 5 percent contained on Friday. An arson suspect was arrested in connection with the fire and made a court appearance Friday. So far 12 structures have been confirmed as lost in the Holy fire. Another fire blamed on arson is the Cranston fire in Southern California. It started July 25 and has burned more than 13,100 acres near Idyllwild. The blaze was listed as fully contained on Friday. 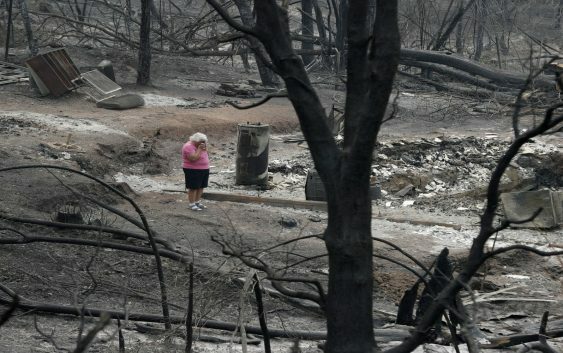 The deadly Ferguson fire near Yosemite National Park continues to burn. The fire, which remains under investigation, has burned more than 95,500 acres and resulted in 2 fatalities and 10 structures destroyed. It was listed as 80 percent contained as of Friday.